It welcomes you in a warm atmosphere and enjoys a very pleasant location in the heart of the main street of our city the Nevsky Prospect. Ideally located at the heart of the classy 'golden triangle', halfway between the the State Hermitage and the Moscow rail station. 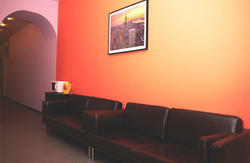 In our small and calm place we offer spacious and cozy Double/Twin, Triple and Family rooms with breakfast. from Airport "Pulkovo 1 and 2": Take any bus or shuttle from airport to arrive to the close metro station "Moscovskaya". from metro st. "Moscovskaya" (blue line #2) go to metro st. "Nevsky prospect'. Change line to (green line #3) and go one more station to "Mayakovskaya". 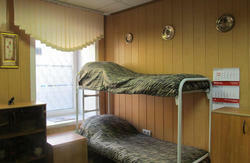 Come out from metro, cross the Nevsky , turn to the left and come up to the building #90. When you come to our building #90, turn to the corner of 'Mango' shop and go through the arch. Our door is from the right side of this arch. Push '10' on the entrance code door and come up to the second floor.